Here's a post I wrote for the now defunct DFB Story Blog in Christmas, 2011. Whip-cracker Tilda (pictured right) - now Senior Editor at Hot Key Books and Picadilly - requested blog posts about favourite stories for the season. Well that’s a really tough call for this author who’s read (and LOVED) gazillions of stories this year. So I thought ’twas more like the season to wax nostalgic for all those stories I have adored in Christmases past. 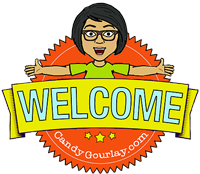 This past year there has been some controversy about school reading schemes vs ‘Real Books’ … but growing up in the Philippines at a time when there was hardly any local publishing for children, I discovered many of my favourite stories in reading schemes. These were imported from the United States and so featured no Filipino characters whatsoever (but that’s another story) … so it was all fantasy to me. 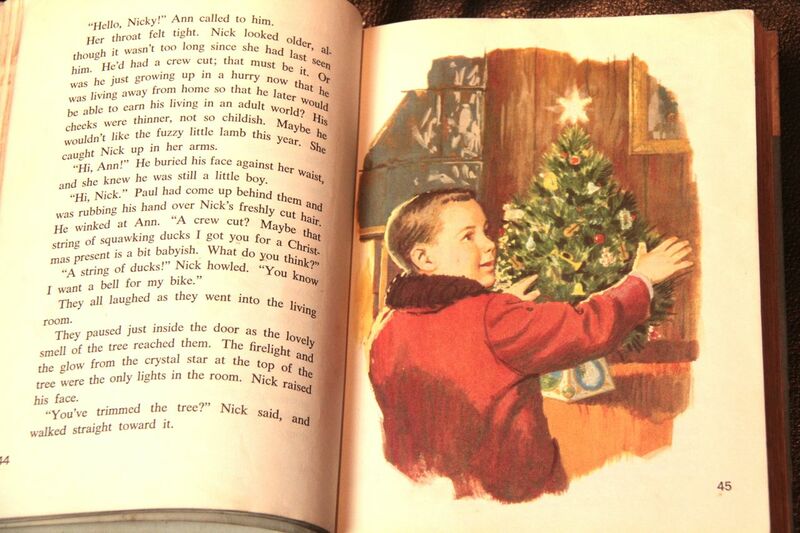 My Christmas favourite was a short story that never failed to bring a tear to my eye called A Tree for Nick by Mary Lou Brown (originally published in 1959). A Tree for Nick was about a brother and sister decorating a tree for a Christmas tree competition. Except they couldn’t help thinking about their eight year old brother Nick, who was blind. So they left out the shiny, sharp edged foil stars and the electric lights that burned Nick’s hand when he accidentally touched them last year. Instead, on went the soft fuzzy sheep and candy canes and the old horn that hooted when you blew it and the old tinkling music box. The tree they ended up with wasn’t pretty – but you could feel and taste and hear it. 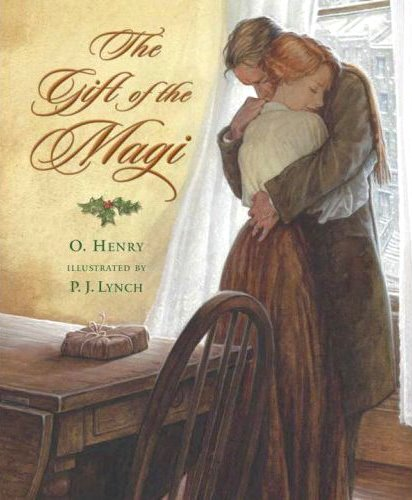 And then there’s the unforgettable short story The Gift of the Magi by O. Henry. 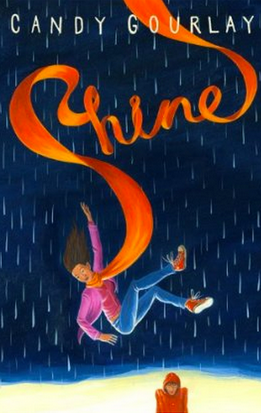 If you haven’t come across this story before, then someone in your reading life has failed you by not recommending it … read it online here. It’s about a husband and wife Jim and Della, who had nothing in the world except each other – oh and Jim had his precious watch and Della her glorious hair. These and love were enough to make them complete. But with Christmas coming, what could they give each other? The O. Henry twist at the end puts the sweet and bitter into bittersweet – after reading this I headed straight for my school library to read the rest of O. Henry’s ouvre of stories with surprise endings. … let it be said that of all who give gifts these two were the wisest. O all who give and receive gifts, such as they are wisest. Everywhere they are wisest. They are the magi. The Selfish Giant had a beautiful garden, but he was too mean to share it with the townspeople and built walls to keep tresspassers out. With no children around, springtime forsook his garden – so no matter the season elsewhere, it was always winter in his garden ( I loved that image!). Then one day the children found a way in … and the Spring returned. But when the giant emerged they ran away. Only one boy didn’t run because his eyes were so full of tears that he did not see the giant coming. And the Giant stole up behind him and took him gently in his hand, and put him up into the tree. 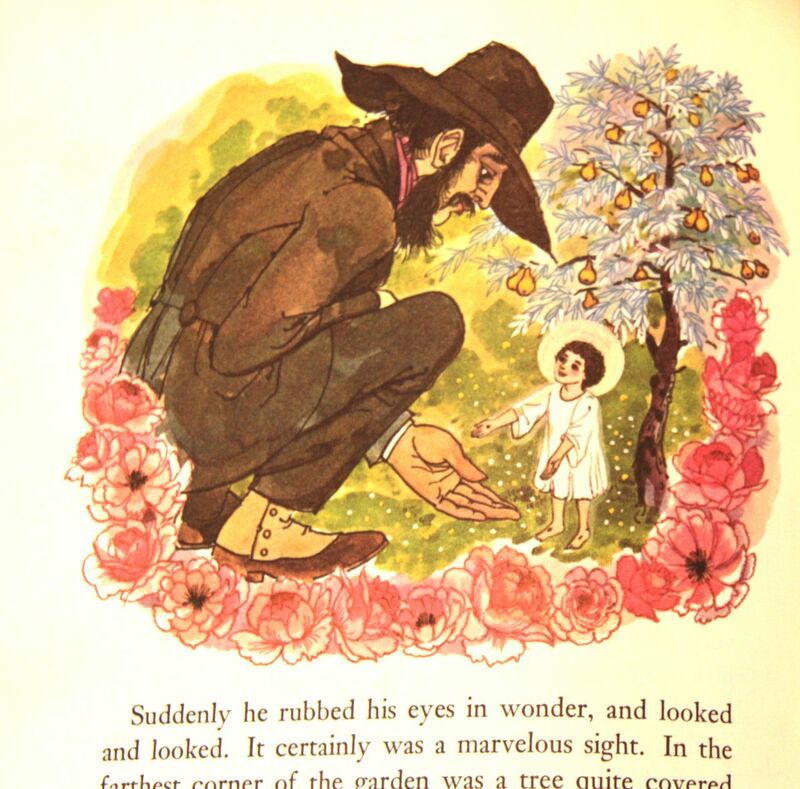 And the tree broke at once into blossom, and the birds came and sang on it, and the little boy stretched out his two arms and flung them round the Giant’s neck, and kissed him. You can probably tell by now that I am a total marshmallow of a reader. But I don’t care … it’s Christmas and anyway I wasn’t born with a stiff upper lip, like some. I was going to mention Clement Moore’s Twas the Night Before Christmas and How the Grinch Stole Christmas by Dr Seuss and The Snow Queen by Hans Christian Andersen … but that would make this long post too long. 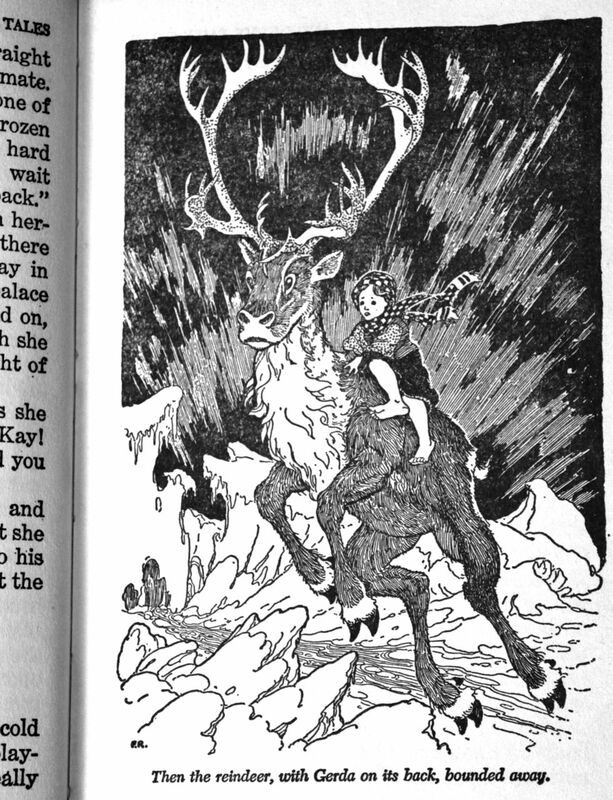 Instead, here’s the magnificent illustration from the book where I first read The Snow Queen – it was in a compilation of children’s classics that my Father bought from one of the door-to-door salesmen who used to ply the streets of Manila selling encyclopaedias and Reader’s Digest anthologies! 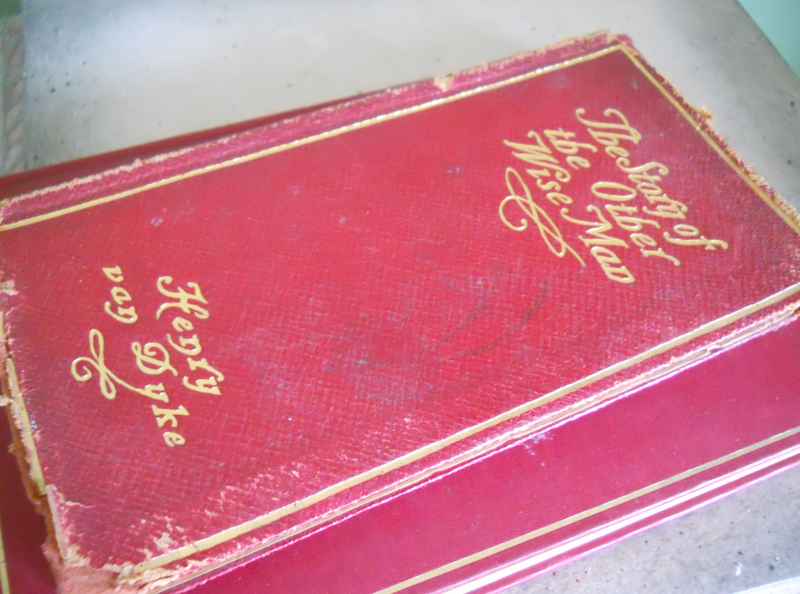 I will finish with the story of The Fourth Wise Man by Henry Van Dyke. Now this is a story I’ve never actually read. It was told to me by my lovely friend Frankie one late night. As young reporters, Frankie and I shared a tiny flat with other girls near work. When we were too broke to go out we used to tell each other stories and this was one that I’ve treasured and myself retold to others through the years. I’ve been reluctant to actually read it because knowing the exact words might spoil the magic of that memory. I’ve discovered since that it was a book published in 1899 called The Story of the Other Wise Man. There was a film made called The Fourth Wise Man, which was what Frankie called it. Everywhere you look, people talk about three wise men. But the truth is, there were FOUR. The Fourth Wise Man wasn’t as clever or organized or persistent as the other three. In fact very early in the journey, he gets left behind by the others because he stops to help a dying man. He spends the entire story going the wrong way and getting distracted by other people’s problems (this was described in great detail by Frankie, with sound effects, but I haven’t got time to go into that now). Indeed, in the process he finds himself one by one giving away the jewels he had intended to give to the Christ child. It takes 33 years for him to find the Christ child – who isn’t a child anymore but a man hanging on the cross. And the Fourth Wise Man feels like a failure because he has nothing to help him with, he could buy Christ’s freedom but he’s given away all his jewels. Verily I say to thee, all that helpful stuff you’ve been doing, you’ve been doing for me. Now you don’t have to be a Christian to get the shivers at that turn of events. In fact you don’t have to be a believer to embrace the good that comes with the Yuletide season. The other day, I listened to a beautiful Thought for the Day on Radio 4 by Professor Mona Siddiqui, a muslim reflecting on the meaning of Christmas. Siddiqui describes a strange yearning to be part of the celebrations at Christmas time. Christmas gets a bad press because of all the advertising and the shopping and the greed. ‘What’s the point?’ some say. Well these old stories remind us of the season’s true meaning . It’s not about receiving, it’s about giving. And with some gifts – like these old stories – the giving will never end. Dear Reader, here’s hoping you had a splendid Christmas – and may the stories be with you in the New Year!